This accursed Age needs heroes more than ever before. Shattered by the Great Rift, the galaxy is on the brink of oblivion and madness. There are those who fight for a shred of hope, a glimmering promise that this millennium may yet endure. What will you fight for? What will you sacrifice? Enter a galaxy full of danger and mystery, plagued by the star-spanning schemes of the Dark Gods. You will defend the last bastions of civilization against a rising tide of corruption. You will explore ancient ruins of races long-vanished. You will uncover lost secrets and devious schemes. This is a game of danger and mystery. This is a game of action and adventure. This is a game about the struggle to hold back the doomsday clock from striking midnight for an entire galaxy. 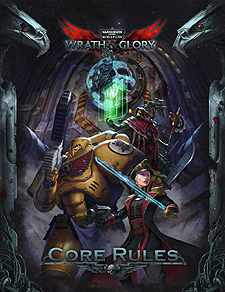 This is your story of Wrath and Glory.